The compilation originally sent to the Mountaineering Council of Ireland included a sub list entitled ‘Hills that need on the spot surveying with the prospect of being future additions.’ This sub list comprised all hills identified from map study that were at or above 500m and below 609.6m (2,000ft) in height and if surveyed for drop stood a chance of qualifying for the main P30 list. At the time of compilation the spot heights on Ordnance Survey of Ireland and Ordnance Survey of Northern Ireland maps were taken at face value as the margin of uncertainty applicable to the surveying method that ascertained them was unknown at the time. Therefore if a hill was given a drop value of 29m from its summit and col spot heights it was not included in this ‘Hills to be surveyed’ sub list as it was deemed not to warrant a survey for inclusion into the main P30 list as the map had given it 29m of drop. This sub list has now been standardised and comprises all Irish hills that are at or above 500m and below 609.6m (2,000ft) in height and have 20m or more and below 30m of drop, the name of this sub list is the 500m Subs. 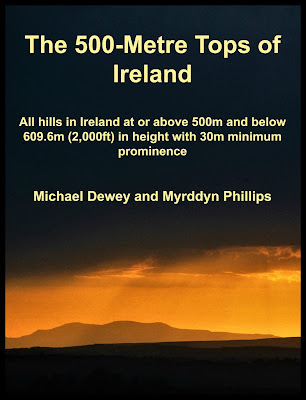 The 500-Metre Tops of Ireland listing was next fully re-evaluated with assistance from Jim Bloomer prior to it being published on the Hill Bagging website on 1st June 2011, and it was then published in the downloadable Access and Excel versions (v12.0) of the Database of British and Irish Hills (DoBIH) on 27th November 2011. During this process the original sub list was fully re-evaluated and appeared in the Hill Bagging publication entitled subMyrddynDewey, this sub list is referred to as the 500m Subs in this Change Register. Although the criteria has remained the same the list has changed greatly since its first publication with the advent of independent surveyors enabling greater accuracy for numerical data, and the meticulous research conducted by Paul Tempan and incorporated by MountainViews, the listing also now incorporates three Sub categories, the 500m Subs which this Change Register details, the 490m Subs and the 490m Double Subs. It seems fitting that the list of The 500-Metre Tops of Ireland – 500m Subs should now benefit from a detailed Change Register, and although the majority of updates to this sub list took place when the data were re-evaluated prior to publication on the Hill Bagging website in 2011, it is prudent for this Change Register to initially detail the changes to the list since this publication. 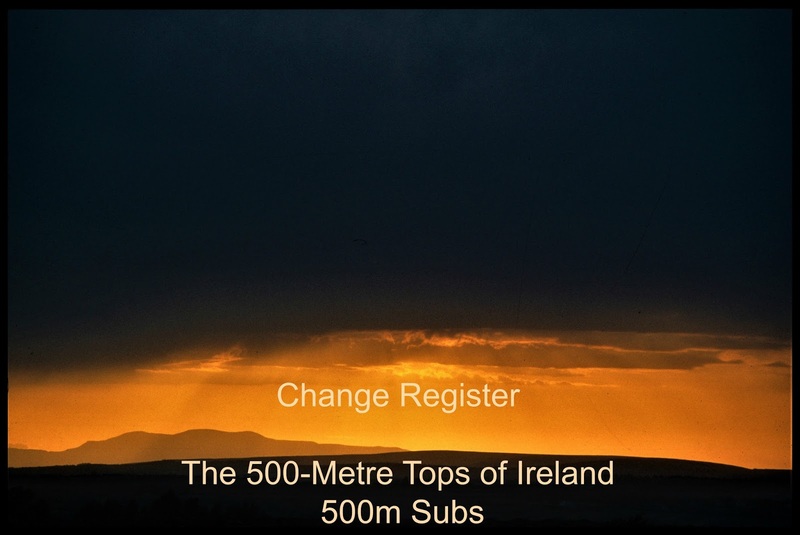 The Change Register to The 500-Metre Tops of Ireland – 500m Subs appears below with the reclassifications to the list being detailed chronologically in receding order. This hill’s inclusion in the 500m Subs list was announced on the Mapping Mountains site on 24.08.16, the hill was not previously listed in the 500m Subs as assessment of contour interpolation had given it only c 19m of drop, just under the 20m minimum drop required to qualify for this sub list. However, upon Jim Bloomer’s suggestion to re-assess this hill’s data it was included in the 500m Subs and listed with a 534m summit height based on the spot height on the Ordnance Survey of Northern Ireland 1:50,000 Discoverer Series map 29, the Harvey map and the Mournes Activity map, and an interpolated col height of c 514m, which gave this hill a listed drop of c 20m, this is sufficient for this hill’s inclusion in this sub category. The 500-Metre Tops of Ireland – 500m Subs total increases by one and confirmed as 58. This is the first hill to be reclassified to the 500m Subs list from the main P30 list, and its reclassification was announced on the Mapping Mountains site on 06.11.15, the hill was previously listed as a 500m P30 based on the 513m summit spot height that appears on the Ordnance Survey of Ireland 1:50,000 Discovery Series map 84 and an interpolated col height of c 482m, which gave this hill a listed drop of c 31m. The hill was subsequently surveyed by John Fitzgerald on the 30.05.15 with a Trimble GeoXH 6000 resulting in a 509.1m summit height and 482.6m col height, the surveyed drop of 26.5m is insufficient for this hill’s retention in The 500-Metre Tops of Ireland list and it is now reclassified to a 500m Sub. The 500-Metre Tops of Ireland – 500m Subs total increases by one and confirmed as 57. 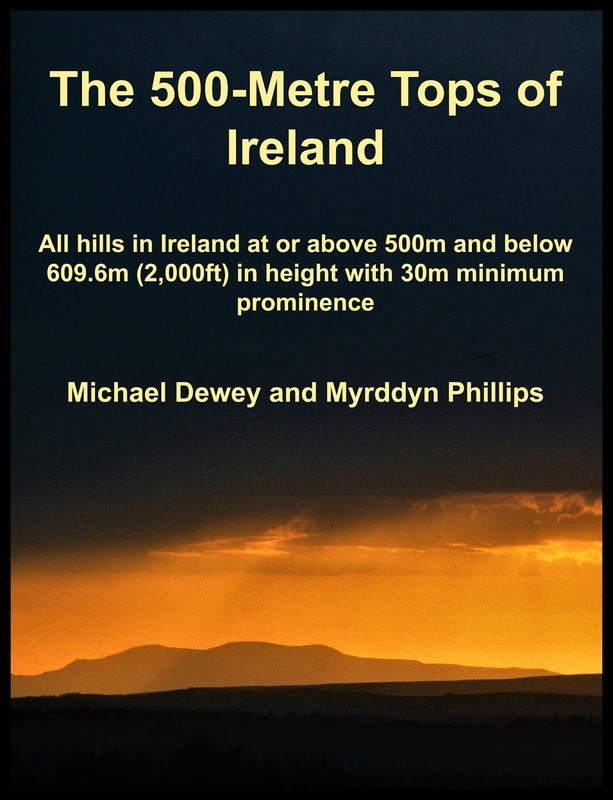 The 500-Metre Tops of Ireland – 500m Subs total confirmed as 56.